The CV90 is the current tracked combat vehicle of the Swedish army, operated by the mechanised infantry and armoured units. 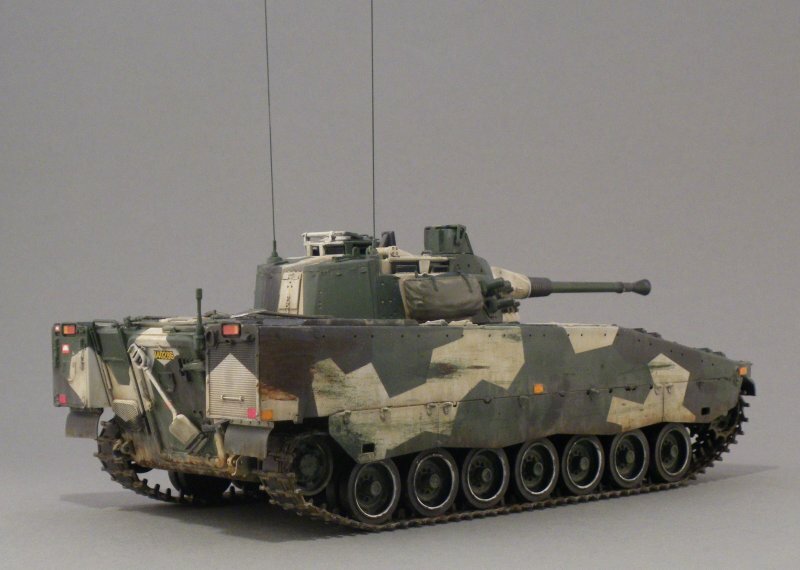 The CV90, called Stridsfordon 9040 locally, were built to accompany the newly acquired Strv 122/Leopard 2 in the early 90s. The family of vehicles were developed and built by the Swedish companies Hägglunds and Bofors. The CV90 is also exported to a handful of European nations, and have served in peace keeping operations in various parts of the world. We have waited long and hard for this kit up here in the cold and dark north. Now the light has appeared in the form of Academy’s CV9040B. There haven’t been that many finished CV90’s published on web yet so this article is my way to start to correct this. This article isn’t a kit review, if you want to read about the kit check out Erik’s review here. 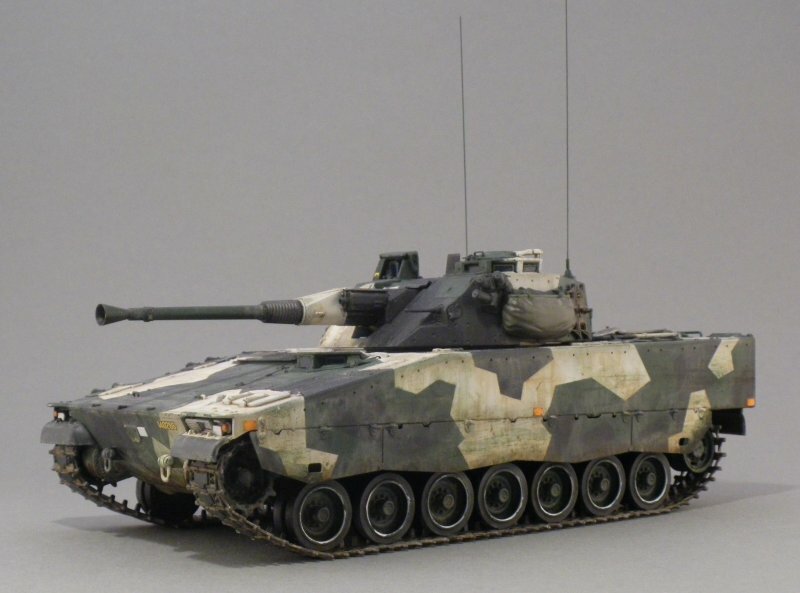 I usually don’t build my models to a dead line but this project turned out that way, as a friend asked if I could build a CV90 for a small display at his museum. I only got a couple of weeks so I dived into the build right away. Unfortuantely this also meant that I didn’t take that many photos during the process. As initial reviews of the kit implied that it were correct in most aspects, I didn’t intend to do any major modifications. Assembly went ahead without any problems. I added some wire antennas and switched the kits turret side storage boxes for two of Legends boxes (LF1213 “CV9040 stowage set”). The Legend set includes stowage for two vehicles, one “separate box” set and one “box and tarpaualin” set. I used the “separate box” set. The kit comes with the turret coax MG-barrel missing, I made one using an electric wire, keeping some of the insulation to simulate different thickness of the barrel. The stripped of insulation also work nice as turret coax MG-barrels wich I use often. In the kit the front vehicle position reflectors and their mounting plates are missing, theese white square markings are missing on the decal sheet even though the orange and red are provided. This didn’t really bother me as I used white plasticard as front markings and used Echelon red and orange reflectors (D356035, D356083) on the sides and rear, I fixed the Echelon reflectors with superglue as the sticker adhesive didn’t seem that strong. If they are worth the money is up to you but they do look a little more alive than the kit decals, I can’t deny that. The kit comes without a tow wire, this is usually carried on top of the hull right behind the turret, I choose to leave this out on my model. I used the link-by-link tracks as I prefer them to rubber tracks, which is also included in the kit, a nice touch there Academy. Both looks nice and on a model with the side skirts mounted, it really doesn’t matter which one you choose. 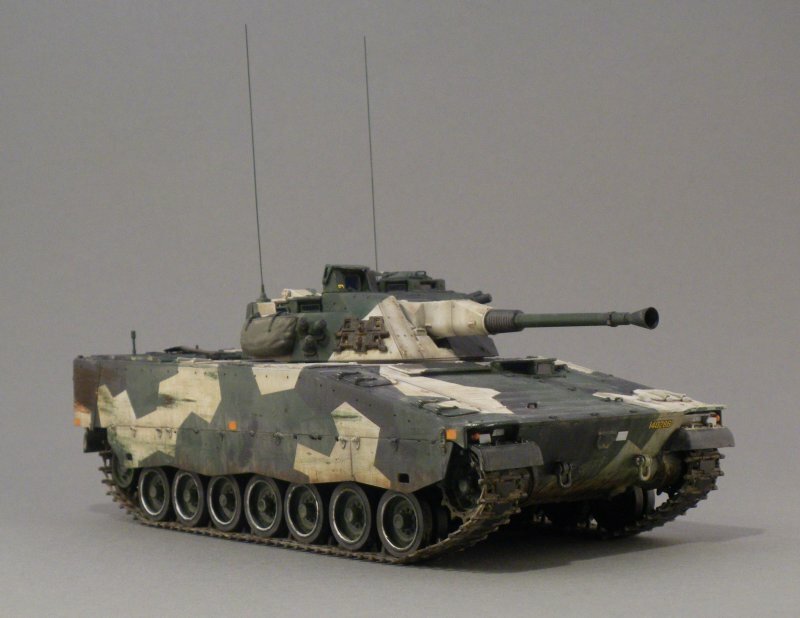 If you opt for a model with the whole track-pack visible you might go for the link-by-link option to get the right track-sag as the CV90 doesn’t have any track return rollers. The swedish splinter camouflage is allways a challenge and this time I wanted a vehicle in winter dress. This isn’t used very often in southern sweden where I live but it is used regurarly in the northern parts on the country. 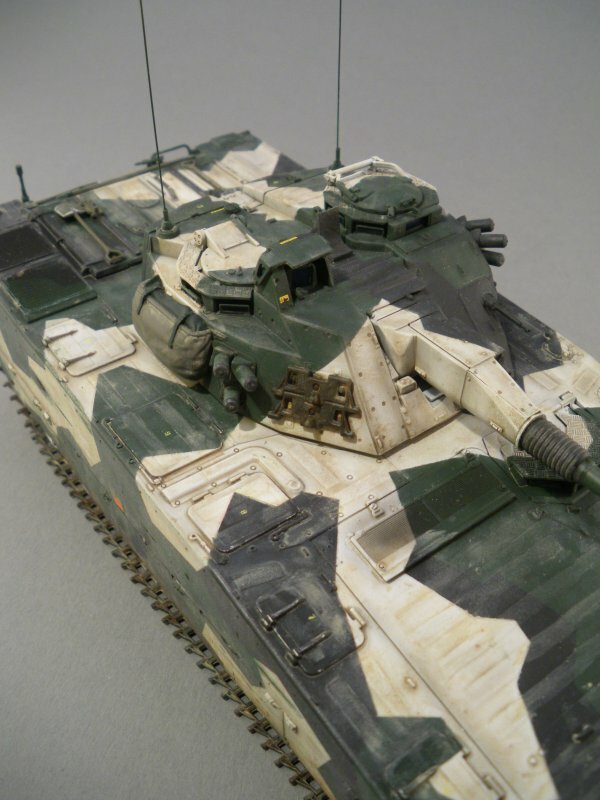 The winter vehicles often show a heavy weathered white paint and dirty vehicles and this were the goal of my paintjob. I’ve just recently discovered Artists oil paint after many years in modelling and wanted to continue to aquire more experience with them on the CV90. Now on to the masking! Nedless to say the splinter paint scheme requires a lot of tape and patience. Perhaps this is a reason why we don’t see more finished CV:s. The green were followed by XF-69 NATO black, the white were saved for last in case I were to change my mind about the winter camoflauge and go for the light green summer one. Details were painted with varous humbrol enamels. The decals in the kit were supplemented with some storage box numbers from Echelon, from their Strv 122 sets T35003 or T35007. A coat of clear varnish to seal the decals and to make the washes more easy to handle followed. As I am new to oil paints I only use three colours; burnt umber, raw sienna and black and mixes of them diluted with artists white spirit. Theese seem to get you quite far, with armour models anyway. The weathering were done in several layers (as usual), starting with a quite thick black/dark brown pinwash to accentuate details, followed by three/four lighter shades finishing with a light wash representing collected dust. The anti skid surfaces got an extra treatment with the lightest wash as theese quickly attract dust. first apply some solvent so that the paint doesn’t stick to the surface too hard, add more paint than you need and push it around and leave it to dry for a while, (15-30min). When most of the solvent has vapoured, start removing most of the paint and add more solvent if the paint has hardened. The fact that oil paint takes more than a day to harden wasn’t news to me but that this made it so easy to work with on models, I’d never had guessed. If you haven’t tried oil paints for weathering yet, do it! I’m irritated that I didn’t tried it before, it’s so much easy to work with than enamels. The only backside is that you need to let the oli paint dry a while before a new wash is applied not to dissolve the previous layer, but if you are sparse with with the solvent this isn’t a big problem. I keept the chipping to a minimum to concentrate the wear and tear to the white washed surfaces. The side skirts were weathered with the oil paint in the same manor as the rest of the vehicle after some worn down areas were painted with the the green base paint. The undercarrige and tracks were given heavy dark washes and some thick oil paint straight out of the tube to simulate collected dirt. The tracks and wheels were then dry brushed with Humbrol metal paint (27002 polished aluminium) to simulate polished metal, the outer wheel rims on the CV loses its paint quickly giving the wheels a distinct shiny ring pattern. A matt varnish coat followed to dull some shiny areas. Finally exposed areas were metalized with humbrol metal paint and lead pencils. The CV is a nice kit, and if you give yourself the time to mask the splinter camouflage and put some effort into the weathering the model can turn out really good. I’ve succeeded quite nice with my latest models due to my newly found favourite weathering paint – artists oil colours. Theese have given me a new way of working with layers as they at the same time are forgiving in that they can be removed hours after they dry. This gave me the courage to push my weathering further witch result in, in my eyes, more realistic models. Finally I’d like to thank friends and fellow modellers for their encouraging and kind words regarding my model. 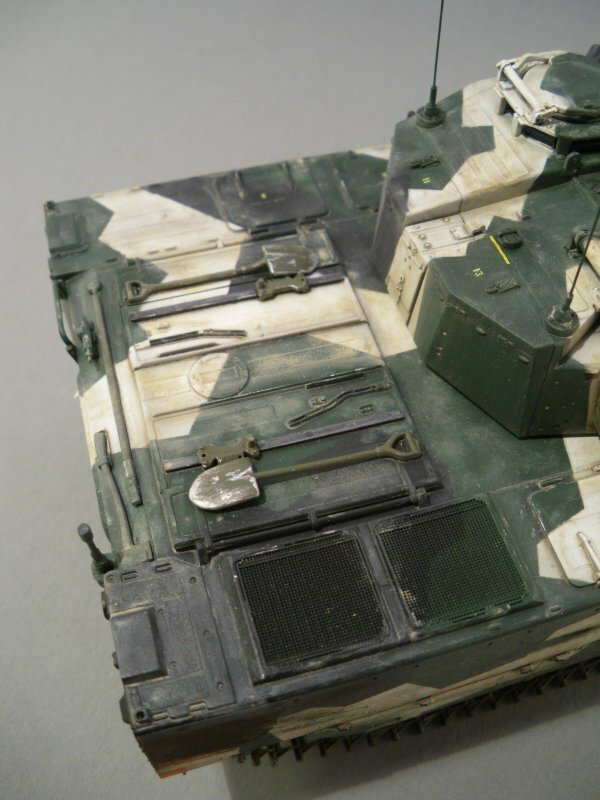 This entry was posted in Finished work, Gallery, Swedish Plastic and tagged 1/35, Armor, Armour, CV90, oil paints, Strf 90, Tomas Johansson, weathering. Bookmark the permalink. I just read your article on the net. 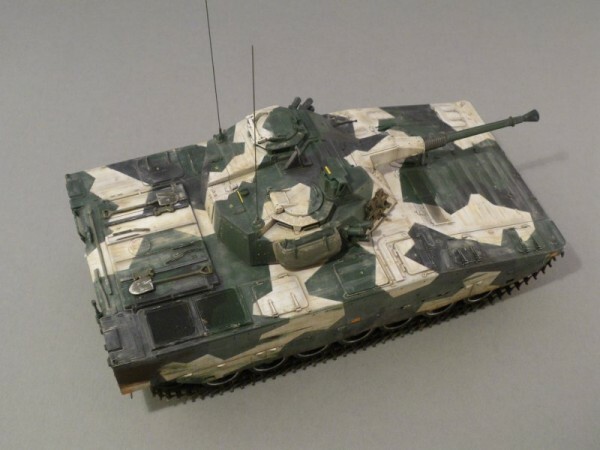 As my brother has moved from The Netherlands to Sweden (Edsleskog), I am also trying to make a CV90 in wintercamouflage for him. You did a great job, especially the white color making dirty. If you have more fotos of the making of, I would much apreciate it if you would sent met a couple. 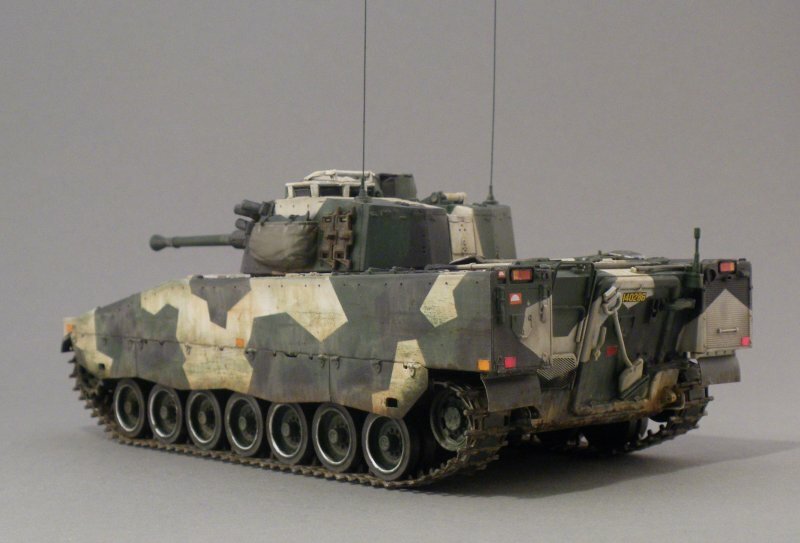 The Dutch forces uses the CV9035, unfortunatelly there is no kit as this momemt.